Will Weekend Splurges Ruin My Diet? I do so well during the week. I avoid the temptation of muffins and cakes. I eat under my calories while walking 5K a day as part of my self challenge to move more. I fill my plate with veggies, eat oatmeal for breakfast, and then, as Friday evening rolls around, I ruin it all. For the last few months, I've bemoaned the social eating I tend to do on the weekends. I belong to a supper club who delights in tempting me with pomegranate tarts, fresh baked bread, and cheese stuffed steaks. 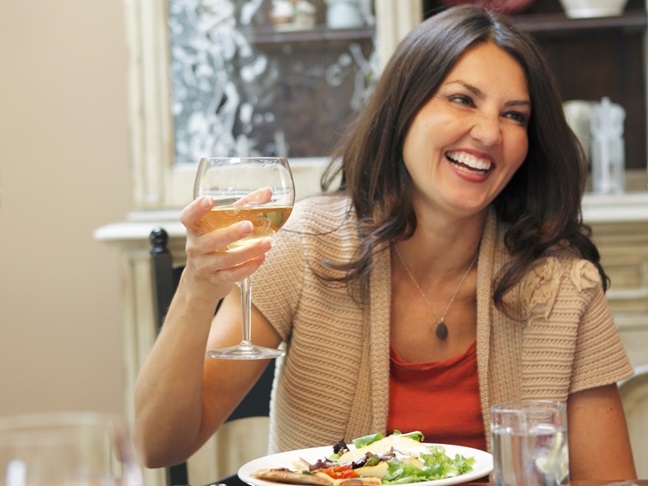 Birthday parties and date nights compete with girls night out and wine club parties. During the week, I'm a saint. On the weekends, I'm a sinner. I recently read an article, though, that gives me some hope. Apparently cheating on your diet on the weekends doesn't really impact your weight loss. This is very good news indeed. As Sunday night rolls around and my calorie count is too depressing to add up, the thought that I've destroyed my hard earned progress makes me want to give up completely. In a form of self-sabotage, I bake a batch of cookies and shrug. After all, I've already screwed up. Now, though, I realize those little treats and cheats on Saturday and Sunday—the wine, the cocktails, the bread, the cheese, the salamiy—won't really impact my diet as long as I am sure to stick with it the rest of the time. There's freedom in that thought. Freedom to enjoy the parties and the dinners without a niggling thought in the back of my head that I'm being "bad". There's freedom from the stress of worrying about what I can eat when I'm at a restaurant. There's freedom to pick the sinfully delicious creme brulee instead of asking for a cup of tea. In that freedom, I'm hoping I can find balance. After all, as I maneuver through this quest for better health, I'm also looking for something I can maintain. I love food. I love the taste of good food. I love the social aspect of it. I'm an Italian mama who feeds those she loves and serves herself a helping as well. Finding balance with my diet and exercise plan can only lead to success. I've been reading a lot about "common sense" dieting…a form of listening to your body, of filling it with fresh and whole foods, but listening to what it tells you. This idea of perhaps not obsessing over what I eat on the weekends seems to lend itself to a way of life when food won't play a primary role. Now, fingers crossed the research is right, because with Valentine's Day and its dinner of potato samosas and curry, I'm a little worried about what that scale I stuck in my garage will say in thirteen days.